This year, I have really been worried about my kids feeling entitled for Christmas. I want to teach them that Christmas isn’t about the gifts you get, but what you give. Even though they are still fairly young (ages 7, 5, and 2), I want them to grow up knowing that Christmas is about serving others and sharing what you have with those around you. One way that I am hoping to do this is through random acts of kindness. I love hearing stories of how people brightened someone’s day with just the simplest act and I want my kids to experience this first-hand. So, starting tomorrow, we are going to be doing one random act of kindness each day until Christmas. I am keeping the ideas simple enough so that my kids can be involved as much as possible and I hope to be able to help them understand the true meaning of Christmas. Do you have any favorite random acts of kindness? I would LOVE to have you share them with us! 2. Donate food to your food bank- either purchase food or go through your pantry. 3. Donate pet supplies to the shelter and go pet some of the animals. 4. Help a sibling to a chore or other job. 5. Donate books you no longer read or need. 6. Put money in the Salvation Army bucket. 7. Bring breakfast to your school teacher. 8. Leave a little treat in the mailbox for the mailman. 9. Take a treat to the local fire station. 10. Fulfill an angel tree request. 11. Go to a nursing home and visit – take around candy canes and wish them a Merry Christmas. 12. Write grandparents a letter / draw a picture and mail it to them. 13. Leave an extra large tip for a server/waiter along with a note wishing them a Merry Christmas. 14. Leave one dollar bills around a dollar store (especially in the toy section!). 15. Pay for the person behind you in a fast food drive-through. 16. Make a treat and a Christmas card for the school bus driver or crossing guard. 17. Donate coloring books to a hospital waiting room. 18. Offer to take the neighbors dog for a walk. 19. Hold the door open for people behind you (this is great if you are out Christmas shopping- and it teaches great manners). 20. Smile at every single person you see for one whole day (makes a great family challenge!). 21. Write a thank you note for a teacher or coach or someone who has influenced you and mail it to them. 22. Take a treat or note to a neighbor or friend who could use a pick-me-up. 23. Write thank you notes or put together care packages for those who are serving our country in the military. 24. Have a bake sale or fundraiser and donate all the earnings to a local charity. 25. Go buy inexpensive socks, beanies, and mittens (the dollar store has lots of great ones!) and deliver them to a homeless shelter or keep them in your purse and hand them out if you come across any homeless people. 26. Leave some extra money in the vending machine (or even tape it to the outside with a note that says “This treat’s on me!). 27. Buy a little treat or give a thank you note for the cashier at the grocery store. 28. Tape some money to the gas pump for the next person who gets gas. 29. Babysit for a single parent so they can have some alone time or even get some Christmas shopping done. 30. Clean out your garage or storage area and give stuff away for free on Craigslist. 31. Donate blood (my kids won’t be doing this, but I am a big believer of it!). 32. Invite someone who lives alone over for dinner. 33. For one day, try to pick up at least three pieces of trash wherever you are. 34. Send unexpected flowers to someone you appreciate. 35. Run errands for elderly/widows in your area. 36. Take a treat and/or thank you note to the janitors at your school. 37. Double the dinner you are preparing and deliver it to someone who could use it. 38. Put together a full Christmas dinner (turkey, potatoes, gravy, rolls, etc) and drop it off at someone’s house who could use it. Ring the doorbell and run away so it’s anonymous (and so much more exciting!). 39. Sit with someone at lunch that looks lonely or that doesn’t have very many friends (a good challenge for your kids!). 40. Compliment at least 5 people in one day (this is also a great challenge for kids!). 41. Smile at 5 complete strangers in one day. 42. Help someone in your area wrap Christmas gifts. 43. Take a treat and/or thank you card to the school librarian. 44. Do an extra household chore without being asked. 45. Make a homemade bird feeder and hang it outside (like a pinecone rolled in peanut butter and birdseed). 46. Donate diapers and wipes to a local women’s/family shelter. 47. Buy some new coloring books and crayons and leave in a hospital waiting room. 48. Decorate some pillowcases and take them to a local children’s hospital. 49. Collect jackets, blankets, and shoes and take them to a homeless shelter. 50. Tape bags of microwave popcorn to the Redbox rental machine. A wonderful list for all of us, but really neat to teach our kids to be lifelong givers. This will make wonderful memories for both your kids and the recipients. 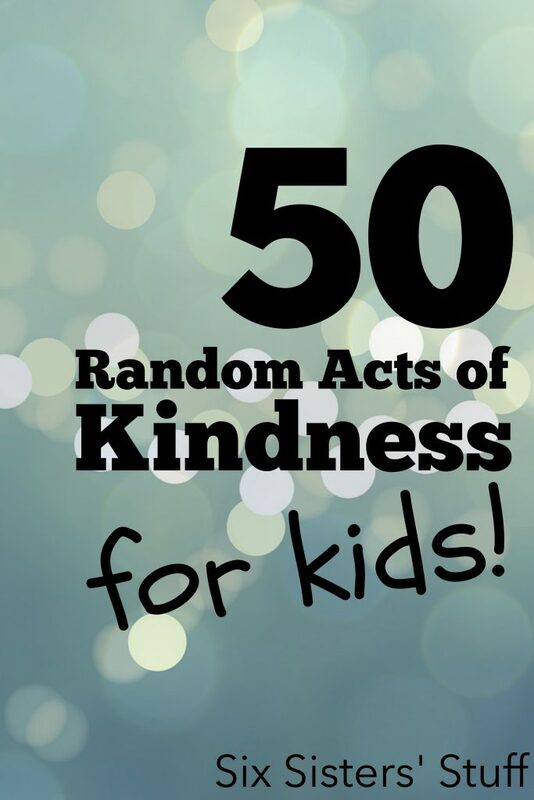 I appreciate this list because these acts of kindness will teach kids about empathy and humility. My daughter is only 2 right now, but I know I need to lead by example. (: Thank you for bringing this to the forefront of our minds this season! Totally doing this with my girls next year! Thanks for the awesome ideas! My boys are currently 2 & 3, last year we called our local nursing home to see if there were baking restrictions & luckily there were not. It was also important to me that we were able to hand deliver them. We made homemade sugar cookies (the kids got to help frost them) & peanut butter blossoms then bagged them. Calling ahead allowed them time to prepare for people with diet restrictions or allergies. We had a blast & made so many lasting impressions. This year, we're going to find a children's hospital to add to the list. This list is amazing. As a mother of two little ones, I'm always searching for new ways to help teach them not only to think of others and to serve them, but how doing so can actually be fun! Thanks for the tips!